Winter is right around the corner and with it comes snow, ice, and freezing temperatures. Being on the road means drivers deal with these elements more than most. Here are a few things to do to help you prepare for the coming weather. Before starting your trip each day, check the forecast along your route. Know beforehand if it is going to be snowing or slick. Slick and snow-covered roads will affect your drive time and may make it impossible to drive as far as you are expecting. 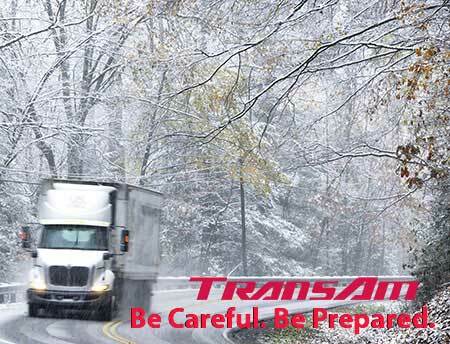 Knowing what the weather will do will let you plan your stops safely so you are less likely to become stranded. There are several things you can do to prep your truck for an emergency. Stock your truck with water and nonperishable food. Blizzards and ice happen. Sometimes it is not safe to move the truck. When this happens, you’ll want to have plenty of food and water on hand. Water is especially important in the winter when the weather is drier and there is a high risk of dehydration. Make sure you are drinking enough fluids throughout the day. Make sure you have plenty of winter clothing: gloves, coats, hats, boots, etc. It may be warm in your truck but it is cold outside. Bundle up properly to lower your risk of exposure when you are outside. Keep extra blankets in your truck. In case there is an emergency, keep a few extra blankets on hand. As temperatures drop, it’s important to stay warm. Store extra coolant, additives, and windshield wiper fluids in your truck. Winter weather is hard on trucks. Snow, ice, and salt from the roads can make the equipment run a little harder. Have extra fluid on hand to keep from getting stranded because of low fluids. Ice, especially black ice, can be very difficult to see and cause significant amounts of damage. Help keep yourself safe by walking with short, deliberate steps when outside. Taking your time can decrease your chances of slipping. Look for debris and ice as your move. When entering or exiting the truck, always use the 3-point stance. 3 points of contact will lower your chances of falling off the truck steps and causing yourself preventable injuries. Slick roads and black ice make it difficult to control the truck and trailer. Always drive at a speed that is safe for the conditions. Going along with this, increase your following distance. Ice and snow can make it difficult to stop your equipment and/or react to situations in time. Give yourself plenty of time and space to maneuver. Remember, you, as the driver, are the decision maker. If you do not feel comfortable driving, communicate the situation to your Driver Manager and do not drive. Keep in constant communication with your dispatch team. No load is worth risking your life and the lives of the motor public. Make it a safe day!